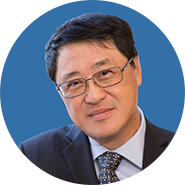 Dr. Lieping Chen obtained his medical degree in 1982 from Fujian Medical School, China. After completion of his training in hematology and oncology at Fujian Union Hospital and Beijing Union Medical College, Dr. Chen earned a Ph.D. in experimental pathology from Drexel University College of Medicine in Philadelphia. After a postdoctoral fellowship at the University of Washington, in 1990, Dr. Chen began his work at the Bristol-Myers Squib Company as a research scientist. In 1997, he became an immunology professor at the Mayo Clinic, Rochester, Minnesota, where he discovered the B7-H1 (PD-L1) molecule and the role of the B7-H1/PD-1 pathway in the evasion of tumor immunity. In 2004, he joined the faculty at the Johns Hopkins School of Medicine, where he helped initiate the first-in-man clinical trial using antibodies to block the B7-H1/PD-1 pathway for the treatment of human cancer. Dr. Chen has authored more than 300 scientific publications and has served on several committees and advisory boards for state, federal, and international research organizations and pharmaceutical companies. His honors include the William B. Coley Award (2014), the AAI-Steinman Award (2016), and the Warren Alpert Foundation Prize (2017). Dr. Lieping Chen currently serves as the United Technologies Corporation Professor in Cancer Research, Professor of Immunobiology, Dermatology and Medical Oncology at the Yale School of Medicine and co-Director of the Cancer Immunology Program at the Yale Cancer Center in New Haven, CT.